Poker is one of the best-known and most popular card games, played at home, at parties, in competition, and in casinos. 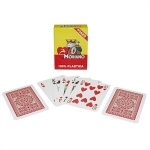 The following is a nice selection of cards for playing Poker games. "Poker-sized" cards are commonly 3½ inches tall by 2½ inches wide, and can be made of materials including various types of paper, different formulations of plastic, and several finish options. to ensure smooth shuffling and durability.